“In the last rounds of confrontations, if 62 people were martyred, 50 of them were Hamas,” said Hamas official Salah Bardawil in an interview with the Palestinian Baladna news outlet. The Iran-backed Palestinian Islamic Jihad had said on Tuesday that three members of its Saraya al-Quds military wing were killed by Israeli forces in Khan Younis. The Israeli military shared a portion of Bardawil’s interview with an Arabic news outlet, accompanied by English captions. 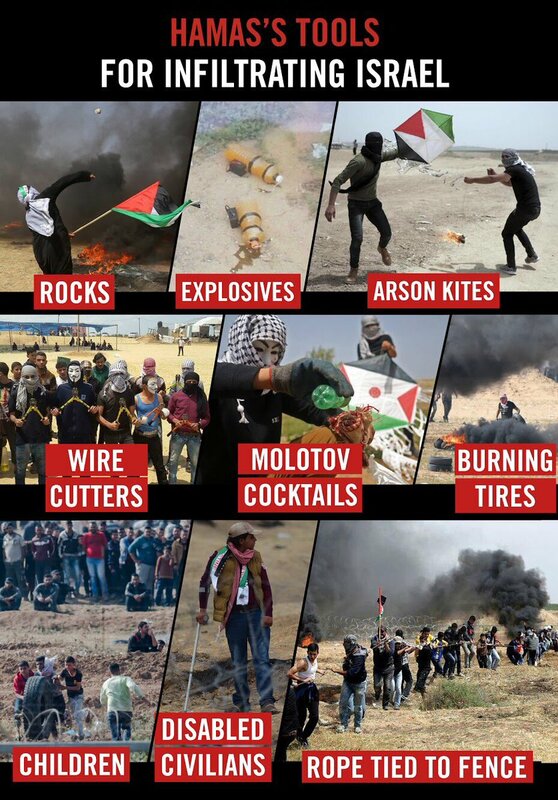 “This proves what so many have tried to ignore: Hamas is behind these riots, and the branding of the riots as ‘peaceful protests’ could not be further from the truth,” said IDF spokesperson Lt. Col. Jonathan Conricus. According to the Hamas-run Gaza health ministry, 62 people in total were killed during border clashes on Monday and Tuesday. Two Palestinian Facebook pages and a forum directing rioters in Gaza gave explicit instructions to murder and kidnap Israelis on May 14, the day the US embassy opened in Jerusalem, as well as suggestions on how to accomplish this goal. It is not clear if Hamas itself was the group sending these messages. What is critical is that Gazans were encouraged to bring weapons to the demonstrations and use these weapons to either murder or capture Israelis. Israeli soldiers may have been facing Palestinians who were using the cover of demonstrating civilians to attempt to break through the border with the goal of murdering and kidnapping Israelis. It’s not particularly surprising that Hamas, a murderous group that routinely uses civilians, including children, as human shields, would stage such a gruesome piece of theater, incentivizing tens of thousands of the citizens it had systemically robbed of a livelihood and a future by offering cash prizes to attack the Israeli border. But it is alarming that so many in the media and foreign policy establishment bought into this cynical and deadly provocation, pretending as if the riots had something to do with Trump and then chastising Israel for defending its borders from rioters who openly admitted that their goal was to randomly murder Jews. Were Hamas’ far more deadly wars in 2009 and 2014 caused by Barack Obama? Of course not. The position that the mobs attacking Israel’s borders were “protesters” is an equally cynical lie. Just look at a snapshot of the day, as recorded by the IDF: Five explosive devices at 12:53 p.m.; another bombing attack five minutes later; six terrorists taking cover among the rioters at 1:15 p.m., opening fire at IDF soldiers; another shooting attack at 1:30 p.m., and another 15 minutes later, this time by eight armed terrorists; three explosive devices detonated at 2:09 p.m. That’s just one random hour out of the day. And it has nothing to do with anything save for Hamas’ repeatedly stated desire to eliminate the Jewish state. To suggest otherwise is to ignore observable reality. That so many of our elites still fall into a cheap propaganda trap set up by a terrorist cult is dispiriting, to say the least. That they further the goals of a terrorist organization by furnishing the backdrop to its macabre and murderous theater is deplorable. But after 2005, and 2009, and 2014, it has become increasingly hard to credit the idea that anyone involved on any side is naive about the nature and consequences of their actions. What’s truly disturbing about yesterday’s events is the idea that they were theater. In other words, that the press knows exactly what it is doing—that news organizations are knowingly partnering with Hamas, and gladly whitewashing the crimes of a ghoulish leadership in return for pictures that they want as much as Hamas does, and that they are happy to pay for in uncritical coverage and free airtime. That kind of cynicism, at the expense of Palestinian lives, is truly breathtaking, even for the Middle East. And it makes us all complicit. COMMENTARY’s Sohrab Ahmari has done invaluable work shaming the Western press for patronizing the Palestinian people and robbing them of their agency. We are told that the Palestinian population in Gaza is acting out in response to a blockade around that tiny piece of land, which has transformed the Strip into “an open-air prison.” Less is said about the actions that led to those blockades: Israel’s unprecedented removal of Jews from Gaza, the 2006 election (Gaza’s last election) that led to Hamas’s ascension, and the conflicts the Hamas-led government waged against Israel and Egypt. All of these things yielded the conditions with which Gazans struggle today. But that was yesterday. Today, the political press has adopted a new narrative into which the old one has been subsumed. That narrative goes something like this: Israel’s violent response to the efforts of thousands of Palestinians to breach the Israeli border (with explicitly murderous intent) has marred not only the opening of the U.S. embassy in Jerusalem but the 70th anniversary of Israel’s founding. On front pages from Sacramento to Seoul, images of the bloodshed at the border were juxtaposed with pictures of American delegates happily dedicating the new embassy—implying without explicitly stating causality. For many in the commentary class, the temptation to surrender to emotion and condemn Israel for its actions has been too great to resist. Yet these positioning statements overlook many of the harder questions with which the political press should concern itself. Among those questions are, for example, why Gaza? Yesterday’s events were not the first of their kind. Urged on by Hamas, Gazans began crowding the border with the intent to harass Israeli security forces as early as February. Those protests quickly became violent, when an improvised explosive device hidden under a Palestinian flag near the border wounded four IDF soldiers and ignited a night of Israeli retaliatory strikes on Gazan targets. Similar mass demonstrations followed in March and April, during which civilians crowded the Gazan border with the express intent to provide Hamas militants the opportunity to breach the fence. Each time, those confrontations resulted in numerous casualties and several fatalities among Palestinians. No doubt, many of those fatalities were civilians; that is to be expected when civilians are explicitly placed in the line of fire. But just how indiscriminate were those deaths? Both Hamas and Israeli officials agree that 80 percent of the fatalities in April —26 of 32 dead—were identified as Hamas militants. As for yesterday’s confrontation, Hamas’s Internal Security Apparatus claimed that 16 of the dead were members either of their organization or the Palestinian Islamic Jihad. A Hamas official has since claimed that as many as 50 of the 60 who were reportedly killed at the border on Monday were “martyrs of Hamas.” As Gen. Martin Dempsey said during Israel’s 2014 incursion into Gaza, though they may at times be unavoidable, “The IDF is not interested in creating civilian casualties.” Some have suggested that Israel should have resorted primarily to non-lethal munitions—as they generally did, indicated by images featuring copious amounts of tear gas. The apparent targeting by snipers of suspected militants suggests that these fatalities were not the result of recklessness by individual IDF soldiers or a crowd control operation gone wrong. 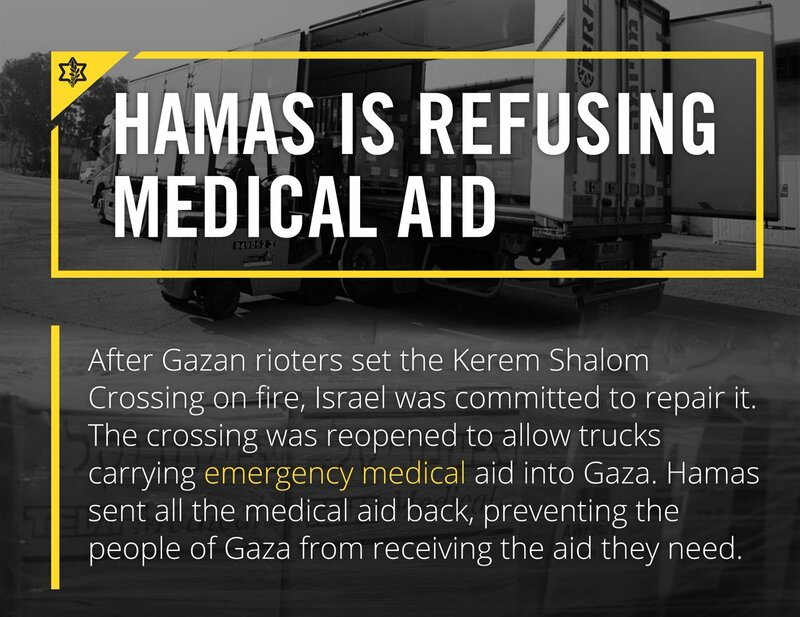 So why haven’t we seen the mainstream Western press repeat Hamas’s Internal Security Apparatus’s claims when they take Hamas’s Ministry of Health’s assertions as though they were gospel? The notion that 1,400, 1,100, or 1,360 people were injured by “live fire” with less than 1 percent succumbing to their wounds defies logic and should be met with skepticism, but those figures are bandied about in the press without concern for their propagandistic effects. And why hasn’t the mainstream press noted the extent to which Hamas officials provided demonstrators along the “Great Return March,” the quickest routes by which they could infiltrate Israeli communities upon breaching the border fence? 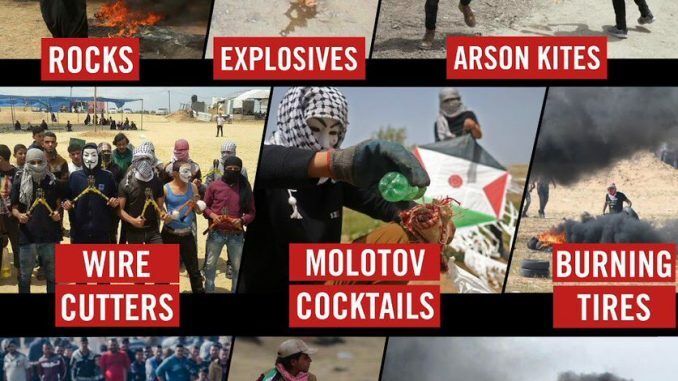 And why hasn’t more been made of the fact that Hamas actively lobbied Gazan civilians to converge on the border while simultaneously using those civilians as cover to launch attacks on the IDF using grenades and Molotov cocktails? Perhaps because to note these things would be to expose the extent to which the press has played precisely the role Hamas and their benefactors wanted them to play. But it’s the dogs that aren’t barking that is the most interesting story to develop in the last 24 hours. It is also the Western media’s biggest blind spot. Extensive coverage was devoted to Turkey’s decision to respond to Monday’s border skirmish by withdrawing its U.S. and Israeli ambassador. President Recep Tayyip Erdoğan has long sought to unite the Islamic world behind Ankara, and Turkey’s outrage over Israel’s actions fits a pattern among majority Muslim nations. Or, at least, it used to. Precious little coverage in the West has been devoted to the non-response to yesterday’s events from Palestinian sponsors in Saudi Arabia, Jordan, and Egypt. Indeed, Egypt has been conveying Israeli messages to Gazan officials in an effort to prevent the escalation of hostilities and to facilitate reconciliation between Hamas-led Gaza and its supposed brothers in the West Bank. Why? Because the West Bank’s sponsors in Riyadh are more closely aligned with Cairo’s priorities than Hamas’s benefactors in Tehran. This should be no surprise. Yasser Arafat could never make that transformation either, from terrorist into head of government. His rejection of Israel’s offer at Camp David was in part a rejection of changing himself from a “resistance” leader in military uniform into an administrator responsible for schools, hospitals, roads. And Arafat was secular; Hamas is Islamist. Its Covenant is a bizarre anti-Semitic document filled not only with Koranic references and calls to expel the Jews from the Middle East, but also explanations that the French Revolution, First World War, and the League of Nations, as well as the Freemasons and Rotary and Lions clubs, were the product of the Jews. 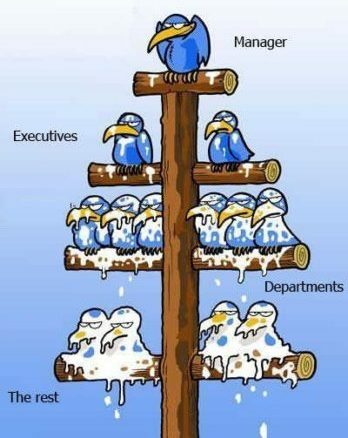 No one rises to leadership in Hamas because he thinks the unemployment rate in Gaza must be reduced or the water supply improved. Asking the Hamas leadership to abandon the battle against the Jews is asking them to abandon their raison d’etre and their life’s work. I suppose it is possible that a tactical retreat can be negotiated by the Egyptians, and they appear to have done something of that sort this week—agreeing to open the Rafah crossing between Gaza and Egypt and getting Israel to open the Kerem Shalom crossing where trucks go through into Gaza) in exchange for an end to the mass border assaults. But how long can that last? Hamas is an Islamist terrorist group dedicated to the eliminating Israel, and will never agree to transform itself into a “normal” government. This leaves Israel and Egypt, and anyone else who is serious about avoiding more violence, with few good options. How can Israel and Egypt pursue a policy of improving economic conditions in Gaza—more electricity, water, sewage treatment, jobs, opportunities to leave the Gaza Strip to study or get medical treatment—without strengthening Hamas’s ability to move terrorists in and out and acquire more weapons or their components? We are familiar with the story of cement: permitted to be imported to build houses, but instead diverted by Hamas into construction of those tunnels. It is worth trying again to reduce misery in Gaza, even if success will be partial or minimal. 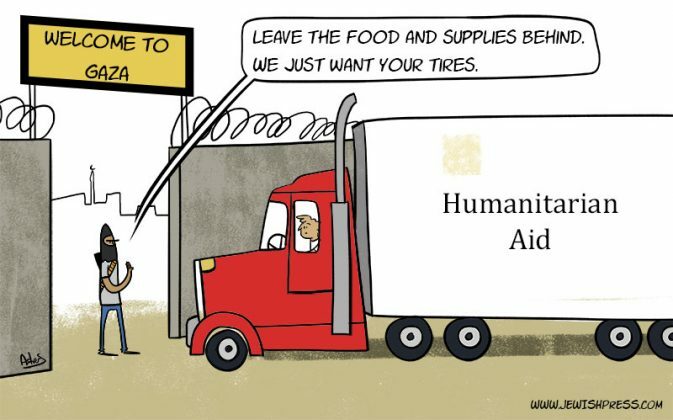 Efforts at humanitarian relief at least show Gazans and moralists in Europe (so quick to jump to facile criticism of Israel, as we saw this week) that the true author of Gaza’s plight is Hamas, which sees Gazans as cannon fodder rather than citizens for whom it is responsible. There is no visible “solution” to the problem of Gaza, because it is today a small Islamist emirate governed by a terrorist organization. For Israel, violence can at best be reduced or delayed, but not avoided entirely, when the goal of the group ruling Gaza is precisely violence designed to destroy you. As in their reactions to previous bouts of violence, the IDF have adopted a graduated response. They have airdropped thousands of leaflets and used SMS, social media, phone calls, and radio broadcasts to warn the people of Gaza not to gather at the border or approach the fence. They have also contacted Gaza bus company owners and asked them not to transport people to the border. When these appeals were ignored — or at least negated by Hamas’ move to pressure the civilian population — the IDF used tear gas to disperse crowds, before relying on warning shots fired overhead. Only when absolutely necessary and legally permitted, has force been used. Defensive actions taken by the IDF have resulted in fatalities. Palestinian authorities claim that approximately 50 people have been killed, with hundreds more wounded. However, of those killed, Israel assesses that 80 per cent were either terrorist operatives, or individuals associated with them. While the price paid for these actions has been high — both in human suffering and adverse international opinion — it has undoubtedly saved civilian lives by preventing a major penetration of Israeli territory. Several high ranking UN and EU officials, in conjunction with human rights groups, have argued that Israel should have acted differently. Yet threats to initiate international investigations, put Israel in front of the International Criminal Court, or invoke universal jurisdiction against Israeli officials responsible for defusing the situation, play into the hands of Hamas. Such moves validate its’ strategy of forcing its own civilians into harms way, and encourage more expansive efforts. Israel’s friends and allies can assist by countering the propaganda that Hamas seeks to generate, pressuring political leaders, human rights groups, international organisations and the media to avoid false condemnation of Israel, and rejecting demands for one-sided UN investigations and resolutions. Such push-back, preferably accompanied by strong condemnation of Hamas’s violent tactics, could help discourage further use such methods in future. Of course, in the face of a heavily entrenched anti-Israel agenda this is more easily said than done. This week’s operations, which are larger in scale than any seen previously, could result in greater numbers of Palestinian casualties than we have already seen. If they do, it is important to remember that Hamas is not only the party responsible, but one one that wanted such an outcome in the first place. The images from Gaza making the rounds across the globe are the product of a well-planned campaign by Hamas’ public relations wizards. Every wounded person is a useful cog in the well-oiled machine, and every person killed is more fuel to pour on the flame of Hamas incitement. This agitated horde, ruthlessly oppressed by a terrorist organization that for over a decade has squashed any chance or hope for a better future, is nothing more than cannon fodder in the eyes of Hamas’ leaders. Not only do they send hate-filled children to breach the border fence to sow destruction and spill Israeli blood, they send them to be killed to exploit their deaths. In complete contrast to Israel, Hamas welcomes either outcome – the murder of Israelis or the deaths of Gazans. The time has come for the international community to realize that by condemning Israel, it only plays into the hands of this destructive equation. Israelis learned this a long time ago, yet the world refuses to understand that when the Palestinians say “days of rage” what they mean is “days of terror.” That when Palestinians say “right of return,” what they mean is “destruction of Israel.” And that when they say “peaceful demonstrations,” what they mean is “incitement and violence.” Vandalizing and burning the Kerem Shalom border crossing, a vital artery for the passage of goods and humanitarian aid to Gaza, is just another example of Hamas’ utter lack of concern for the welfare of the Strip’s residents. Thank you, Madam President. Today’s session was called to discuss the issue of violence in the Middle East. We are all concerned about violence in the Middle East. The United States deplores the loss of human life. But there is a lot of violence throughout the region. And I will note that the double standard is all too common in this chamber, and working overtime today. Last week, Iranian forces attacked Israeli positions on the Golan Heights by launching rockets from Syria. This was a reckless provocation and escalation that must be stopped. It is an example of regional violence that should occupy our attention here in the Security Council. Also last week, Iranian proxy forces in Yemen launched missiles into Saudi Arabia. It was not the first time they have done it. This too is regional violence that should occupy our attention here in the Security Council. In recent days, Hamas terrorists, backed by Iran, have incited attacks against Israeli security forces and infrastructure. That is violence that should occupy our attention, too. The common thread in all of this is the destabilizing conduct of the Iranian regime – a regime that insists on promoting violence throughout the Middle East, while depriving its own people of basic human rights. US Ambassador to the UN Nikki Haley said Tuesday Israel had acted with exceptional “restraint” in clashes on the Gaza border a day earlier in which over 60 Palestinians were killed. Haley was a rare voice slamming the Hamas terror group and speaking out in favor of Israel at an emergency meeting of the UN Security Council called over Monday’s deadly fighting. After ambassadors joined in a rare moment of silence for those killed, Haley said Israel was facing Hamas extremists who incited people who lobbed flaming objects toward the Israeli side of the border fence and urged protest marchers to breach it. “Make no mistake, Hamas is pleased with the results from yesterday,” she said. Rejecting criticism of Israel voiced by other UN ambassadors, Haley said that none of their countries would have acted with the same moderation. US Ambassador to the UN Nikki Haley charged Hamas with orchestrating Palestinian deaths in Gaza, while her Palestinian counterpart Riyad Mansour retorted that she was a racist, during a UN Security Council Meeting on Tuesday. It was a meeting that underscored the increasing enmity between Washington and the Palestinian Authority. Haley, the United States’ representative to the Security Council, arrived late to the meeting, as did Israel’s Ambassador to the UN Danny Danon. They both arrived after the other 14 Security Council members held a moment of silence for the more than 60 Palestinians who the Hamas-run health ministry reported were killed by the IDF in an attempt to quell a violent protest along its southern border with Gaza. It was the bloodiest day since the start of the Hamas-led “Great March of Return” on March 30, which had the goal of breaking down the border barrier and entering Israel. Senator Dianne Feinstein said she was “deeply disappointed” in Nikki Haley, the US ambassador to the United Nations, for stopping the UN Security Council from investigating Israeli actions on the border with the Gaza Strip. The Hamas-run health ministry in Gaza said 60 Palestinians were killed in the violent demonstrations at the fence between Gaza and Israel on Monday, the same day that the United States dedicated its new embassy in Jerusalem, and two were killed on Tuesday. The chief prosecutor of the International Criminal Court vowed Tuesday that she was watching closely the unrest in Gaza and would “take any action warranted” to prosecute crimes. Israeli forces killed 60 rioters during clashes and protests on Monday, when terrorists embedded among the demonstrators opened fire upon and threw firebombs, pipe bombs, and grenades at Israeli soldiers. The Palestinian Authority joined the ICC in January 2015 signing up to the Rome Statute which underpins the world’s only permanent war crimes court. The PA asked the prosecutor to investigate alleged crimes committed in the Gaza war the previous year, and Bensouda opened her inquiry just a few days later. She recalled Tuesday that the “situation in Palestine is under preliminary investigation by my office”. Chicago Tribune Editorial: Who’s to blame for the Gaza violence? If Palestinian leaders want to know who is responsible for the deaths Monday, they should glance in the mirror. That said, let’s also note that many of the demonstrators were peaceful. They came to protest what they call the nakba, or catastrophe: the creation of the state of Israel 70 years ago. They came to reassert their “right of return” to what is now Israel. They came to express their despair — as generations of Palestinians have. And they came to denounce the U.S. embassy switch. But let’s be clear: Moving the American embassy to Jerusalem doesn’t preclude anything in an eventual Israeli-Palestinian peace deal. The fate of Jerusalem has always been part of negotiations between the sides, if and when they start speaking again. A Palestinian state is not foreordained, however. Early in his term, President Trump shook up the Middle East status quo by declaring that he would not insist on the creation of a Palestinian state as part of a peace accord. Leaders of the Palestinians have a choice: They can keep sending their young people to their deaths. Or they can turn from violent confrontation to constructive negotiation. They can resume their path toward a Palestinian state. Even as we write that sentence — expressing the hope for a two-state solution that we’ve repeated over and over — it seems more far-fetched than ever. The reality on the ground is that nothing will change until Palestinian leaders stop inciting violence and start telling their people the truth: Palestinians can have a state. But not until they accept that the Israel they loathe is in the neighborhood to stay. Alan Dershowitz slammed the mainstream media for its “biased” coverage of the deadly clashes between Israelis and Palestinians at the Israel-Gaza border. Protests erupted on Monday after the U.S. opened its embassy in Jersusalem, with more than 35,000 Palestinians gathering along the security fence. When some demonstrators attempted to breach the fence and engage in violent skirmishes, Israeli defense forces responded by opening fire. The White House said that terrorist group Hamas “bears responsibility” for the violence, which left at least 58 dead and more than 2,700 injured, but numerous media outlets painted Israel as the aggressor. Dershowitz, a Harvard law professor emeritus, said that Hamas encouraged Palestinian civilians to storm the border — including women and children — because they wanted the media to report on the resulting body count and dead civilians. The people of #Gaza are victims of the #Hamas regime that puts its extremist ideology above and beyond the interests of the people. As per convention, Egypt’s Foreign Ministry on Tuesday made sure to condemn Israel. Behind the scenes, however, the real story was apparently unfolding – an Egyptian push to end the madness and stop the cycle of violence Hamas wants to impose on the entire region. The Egyptians have never hidden their views on Hamas or its allies – Turkey and Qatar – whom they have considered enemies and still do. With no other choice, they were willing to accept Hamas’ rule in Gaza, but their patience expired when it became clear that the organization was playing with fire, supported by a tailwind from Turkish President Recep Tayyip Erdogan. Eleven years have passed since Hamas seized control of the Gaza Strip and its situation has never been worse. It has failed to adequately manage the daily lives of Gazans. The path of armed struggle was choked off after Israel found a solution to the missile threat (Iron Dome), and no less important – the threat of underground terror tunnels. Finally, its diplomatic escape routes were blocked one after another, once Egyptian President Abdel-Fattah el-Sissi entered office. To escape this fate, Hamas chose, perhaps like Samson pulling the temple down upon himself and the Philistines, a path of suicidal destruction. Primarily, it has sought to create a mass casualty media event to strike at hearts and minds – hopefully while inflicting Israeli casualties – to divert the world’s attention to Gaza and force Israel and Egypt to ease some of the pressure suffocating the group. Hamas is a “bunch of cannibals” who use their women and children as weapons, Defense Minister Avigdor Liberman said on Wednesday, after riots along the Gaza border fence left dozens of Palestinians dead. Hamas claims that 62 Gazans died on Monday. “The Hamas leadership is a bunch of cannibals that treats their children as weapons. They have rockets, sidearms and a different kind of weapon – women and children,” he during a visit to the IDF’s Gaza Division. The violence on Monday was condemned by the international community, with Turkey and South Africa recalling their ambassadors and the United States blocking a UN Security Council statement calling for an independent probe. Still, it is difficult to see how Hamas’s new tactic of controlled rallies can last much longer. Admittedly the number of protesters in Monday’s demonstration reached record highs, but this week had been billed in advance as the climactic culmination of the marches. The general trend on recent Fridays has been of a significant drop in participation. Without actual results or a change in Gaza’s situation, and with a decline in motivation among the populace, it can be assumed that at some point Hamas will be tempted to revert to its basic warring instincts. This could be demonstrated in a military escalation, through renewed rocket attacks; or by attempts to carry out attacks in the West Bank, which would lower the risk of open conflict in Gaza while winning points with the Palestinian public which now demands revenge. Former Defense Minister and former IDF Chief of Staff Moshe Ya’alon spoke to Arutz Sheva about a series of events on Israel’s agenda, from the events of the fence in the Gaza Strip to dealing with kite terrorism, the Iranian arena and even his personal political path. The mainstream media bear “some responsibility” for the deaths of Palestinians at the Gaza boundary this week, because they reward the Hamas terror group for encouraging people to attempt to breach the border. That’s according to U.S. Ambassador David M. Friedman, who spoke exclusively to Breitbart News on the terrace of the King David Hotel the day after dedicating the new U.S. embassy in Jerusalem. “If I could give a word of advice to the media, if they purport to care so much about the Palestinian cause: this coverage of Palestinians running to the fence, burning tires — it’s the fuel or the lubricant for further malign behavior,” Friedman said. The media, he said, bore “some responsibility” for encouraging Palestinian deaths by playing along — wittingly or unwittingly — with Hamas’s scheme. French President Emmanuel Macron told Israeli Prime Minister Benjamin Netanyahu in a phone call on Tuesday that he condemned the violence in Gaza, a day after dozens of Palestinian protesters were killed by Israeli troops. “He expressed his very deep concern about the situation in Gaza, condemned the violence and underlined the importance of protecting civilian populations and of the right to protest peacefully,” the Elysee said in a statement. The Palestine Liberation Organization’s top envoy in the U.S., Husam Zomlot, was recalled from Washington on Tuesday in a move protesting the opening of the America’s embassy to Israel in Jerusalem. Chief Palestinian negotiator Saeb Erekat announced the news on Palestinian television, according to Reuters. Zomlot returned to D.C. from the Palestinian territories earlier this year even as Palestinian President Mahmoud Abbas said he would not accept any peace plan proposed by the U.S. following President Trump’s announcement that he would be recognizing Jerusalem as Israel’s capital. Turkey on Monday recalled its ambassadors to the United States and Israel following the opening of the new embassy, and South Africa recalled its ambassador to Israel in response to the government’s reaction to violent clashes along the Gaza border. Palestinians, who view the eastern part of Jerusalem as the capital of a future Palestinian state, were demonstrating against the opening of the new U.S. Embassy. Israel has faced backlash from the international community for its handling of the demonstrations. An unknown reporter at the end of the State Department’s press briefing on Tuesday berated department spokesperson Heather Nauert with questions about violent protests in Gaza. The reporter was asking questions surrounding the recent protests in Gaza where some Gazans have used firebomb-bearing kites to attack Israel, launching them over the security fence, often to set ablaze crops that Israeli farmers are trying to harvest. The protests are being organized and promoted by the terror group Hamas. Nauert was pointing to how earlier in the briefing she took a series of questions from reporters all over the room and had moved on from that topic. Nauert moved on to take another reporter’s question when the unknown reporter interrupted and demanding an answer. Israel’s Foreign Ministry on Wednesday summoned the Turkish official at the consulate in Tel Aviv for a reprimand after Israel’s ambassador to Turkey, Eitan Naeh, had been humiliated at Ataturk Airport in Istanbul, on his way home. According to Turkish media, Ambassador Naeh was detained for a long time at the airport in Ankara, and the security personnel at the site carried out a strict security check reserved to suspected terrorists. The Foreign Ministry said that the Turkish media were invited to capture the event and humiliate the ambassador. The Turkish Foreign Ministry on Wednesday told Israel’s consul general in Istanbul Yosef Levi Sfari to leave the country “for a while,” according to Anadolu. The ministry told Sfari to leave following the clashes along the Gaza border. Following my previous post on Andrew Bolt’s staunch defense of Israel comes this audio from Nights with Steve Price, featuring Andrew and Steve. In this clip, they deal with some “anti-Zionist” callers (and some of whom are clearly antisemitic). Trust me, you are going to want to hear this. Note: make sure you listen until around 37:30. With all the bad press and news, I find it heartening listening to those who actually get it. Andrew Bolt does, and he’s proven it again here. As Palestinians in Gaza, backed by Hamas and other Palestinian terror groups, continue to riot — setting Israeli fields aflame, throwing firebombs and stones, attacking Israel’s border fence — and to protest Israel’s existence, and as Israeli soldiers struggle to keep the demonstrators from the country’s borders, with tear gas giving way to live fire that has taken the lives of dozens of rioters, media coverage has often failed to accurately report on the clashes. • Since the beginning of May (and as of this writing on May 15), New York Times news coverage of the Gaza clashes has failed to mention that Hamas, which rules the Gaza Strip and organizes the protests and riots, is designated internationally as a terrorist organization — information necessary for readers seeking to understand why Israelis fear the worst if rioters, which include members of Hamas and other terror groups, breach the fence. A Twitter spokesperson defended Hamas’ ability to maintain a presence on the site, despite Twitter’s rule against supporting and perpetuating violence. According to the spokesperson, the group’s alleged commitment to peace and status as a democratically-elected organization exempts Hamas from the explicit rule banning terrorist organizations from the platform. The Hamas Movement Twitter account, known as HamasInfoEn, claims to be the “official account” of the Hamas Movement in its banner on Twitter. While it is possible the account is not actually affiliated with Hamas, it has been cited in reporting by Haaretz, the Jewish Press, The Times of Israel, and others. As recently as March, Hamas called for participation in a “Friday of Rage” on its Twitter account. A Sydney Morning Herald op-ed by anti-Israel activists George Browning and Sivan Barak entitled “Palestinians undefeated as Israel celebrates 70th anniversary” addresses violent clashes on the Gaza border, casting Palestinians in the role of peaceful protesters and the IDF as aggressive killers. Terrorists are using protesters as cover and as human shields while they attempt to infiltrate into Israel, threatening the safety of nearby communities. In building their news themed-fantasy, the authors entirely hide this very real threat. Palestinian diplomats say they welcome the Trudeau government’s decision not to attend the controversial opening of the new American embassy in Jerusalem on Monday. But a spokesman for Foreign Affairs Minister Chrystia Freeland says Canada wasn’t invited. Canada, along with its major allies, does not support the U.S. embassy move to Jerusalem, saying that’s a decision for a future peace agreement between the Palestinians and Israelis. Monday’s inauguration of the new U.S. embassy sparked the bloodiest day in four years at the Israel-Gaza border as Israeli forces killed more than 50 Palestinians. The carnage unfolded several dozen kilometres away from where the Trump administration was following through on its decision to move the U.S. embassy to Jerusalem from Tel Aviv. Hamas leader Ismail Haniyeh was summoned urgently to Cairo Monday, where Egyptian officials severely admonished him over the terrorist group’s insistence on instigating violent demonstrations on the Israel-Gaza Strip border, Israel Hayom learned Tuesday. In Monday’s riots, which Hamas orchestrated over the opening of the U.S. Embassy in Jerusalem, some 40,000 Palestinian demonstrators clashed with Israeli security forces near the border fence. Fifty-eight people were killed and 2,700 people were wounded in the riots. Israel has repeatedly warned Gazans against approaching the security fence, saying it will not tolerate attempts to breach the border. The official said Egyptian officials were stunned by the high number of casualties and angered by information provided by Israel that proved Hamas was paying civilians, including children, to place ‎themselves in harm’s way by approaching the fence ‎and clashing with IDF soldiers so as to allow Hamas ‎operatives to blend into the crowd and try to ‎carry out terrorist attacks. Palestinian protests on the Gaza-Israel border have dropped off dramatically, with Israel on Wednesday pointing to what it said were Egyptian efforts to restore calm after dozens of Palestinians were killed in the violent protests. Gaza’s dominant Islamist Hamas movement, denying any pressure from neighboring Egypt to scale back the six-week-old demonstrations, said they would continue, even as far smaller numbers of Palestinians gathered in protest tents. Hamas leader Ismail Haniyeh made a brief visit on Sunday to Egypt, which also borders Gaza and has sought to broker between the Islamists and Israel. The Egyptian official “made unequivocally clear to him (Haniyeh) that if this continues, Israel will respond and take far harsher steps, and Egypt will stand by and will not help,” Katz told Israel Radio in an interview. Prime Minister Benjamin Netanyahu on Tuesday discussed regional developments and events on the Israel-Gaza border with German Chancellor Angela Merkel. Her office said the right to peaceful protest and assembly in Gaza should not be abused to provoke unrest. German government spokesman Steffen Seibert said “the awful events” on the Gaza-Israel border were of extreme concern to Germany but Israel had the right to defend itself. “It is horrifying that so many people, among them minors, have lost their lives,” Seibert said. Seibert also said Israel must use proportionate force when it comes to live fire, and called on all sides to reduce tensions. 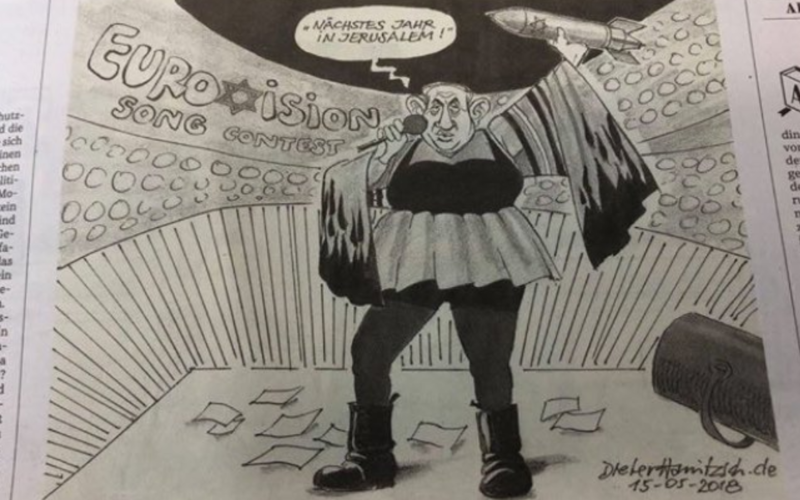 One of Germany’s main newspapers came under fire Tuesday for publishing a cartoon, regarded by some readers as anti-Semitic, depicting Prime Minister Benjamin Netanyahu celebrating Israel’s Eurovision win while holding a missile adorned with a Star of David. The paper subsequently published an apology, but the caricaturist said the publication’s statement did not represent his views. The Süddeutsche Zeitung, the largest German broadsheet daily, published the image on Tuesday as Israel faced criticism over its handling of protests initiated a day earlier on the Gaza border by the Hamas terror group, which openly seeks to destroy Israel. In recent weeks, Israeli security forces were said by the Hamas-run Gaza health ministry to have shot and killed about 100 people in a series of violent clashes along its border with the Gaza Strip, most of them on Monday, the deadliest day of conflict since the 2014 war. Dozens of those killed were members of Palestinian terrorist groups, according to Israel. Palestinian rioters hurled hundreds of firebombs, rocks and flaming kites at Israel and attempted to breach the border fence despite having been warned to stay away. Israel says Hamas plans to send armed terrorists through any breach in the fence to “carry out a massacre” of Israelis. The South African government on Monday withdrew its ambassador to Israel in protest of the deadly violence along the Israel-Gaza border. “The South African government condemns in the strongest terms possible the latest act of violent aggression carried out by Israeli armed forces along the Gaza border‚ which has led to the deaths of over 40 civilians‚” the Department of International Relations and Cooperation said in a statement quoted by the Times Live news website. The Department claimed the victims were taking part in a “peaceful protest” against what it called the “provocative inauguration” of the U.S. embassy in Jerusalem. “Given the indiscriminate and grave manner of the latest Israeli attack‚ the South African government has taken a decision to recall Ambassador Sisa Ngombane with immediate effect until further notice‚” the statement said. South Africa’s ruling party on Tuesday slammed Israel’s recent actions at the Gaza border, comparing the IDF’s efforts to prevent Palestinian protesters from breaching the border fence with Nazi Germany’s cruelty against Jews. Also on Tuesday, the country’s Jewish community leaders condemned their government for recalling the the South African ambassador to Israel in light of Monday’s deadly riots at the Gaza border. The African National Congress “views with complete shock and dismay the Israeli armed forces’ massacre of peaceful Palestinian protesters,” the party said in a statement. “We watched in complete disbelief as a people, who continuously remind us all about the hate and prejudice Jews went through during Hitler’s anti-Semitism reign, will exhibit the same cruelty less than a century later,” the statement read. Jordan’s King Abdullah on Monday stressed that Jordan rejects and condemns what he called “the blatant acts of aggression and violence perpetrated by Israel” against Palestinian Arabs in Gaza, the Jordan Times reported. The King also criticized the relocation of the U.S. embassy in Israel to Jerusalem, warning the move would have serious repercussions on security and stability in the Middle East and will inflame the feelings of Muslims and Christians. King Abdullah made the remarks during a phone call with French President Emmanuel Macron, during which they discussed the latest developments in the Palestinian arena, particularly the escalation in Gaza, in addition to the repercussions of moving the U.S. embassy to Jerusalem, according to the Jordan Times. The King urged the international community to shoulder its moral and legal responsibilities to protect the Palestinian people. He also warned of the consequences of moving the U.S. embassy to Jerusalem, stressing that Jerusalem is the key to achieving peace and stability in the region and the world. Massive tectonic cataclysm, powerful storms, and atomic explosions rocked this version of plant Earth today following the official transfer of the United States Embassy to Israel’s declared capital, making manifest the most dire prediction’s of the move’s consequences, albeit in a different universe from the one in which the transfer took place. Explosions two hundred times more powerful than the blast that destroyed much of Hiroshima erupted across the Earth orbiting this alternative universe, as a direct consequence of the embassy move. Tremors beyond the measure of the Richter scale tore up the crust of this Earth and laid waste to civilization, as tidal waves, lightning storms, and unprecedented amounts of precipitation washed away the remains. Pundits had warned for years of the destructive impact of American recognition of Jerusalem as Israel’s capital and of placing the embassy there, and the current wave of devastation bore out their warnings, even if the destruction is taking place in a dimension inaccessible and irrelevant to the inhabitants of the Earth in which the predictions were issued.